'May you never see the corncrake again!' (Nár fheice tú an traonach arís) was once a way of wishing someone bad luck or worse, since you were hoping they wouldn't live to see another summer. The imprecation implies a culture familiar with the corncrake and its distinctive call, and perhaps, more significantly, with the knowledge that it was a summer visitor. Once common along the river Shannon, the corncrake is now almost extinct due to human and climatic factors that stretch from here to its wintering habitats in Africa and the migration routes in between. 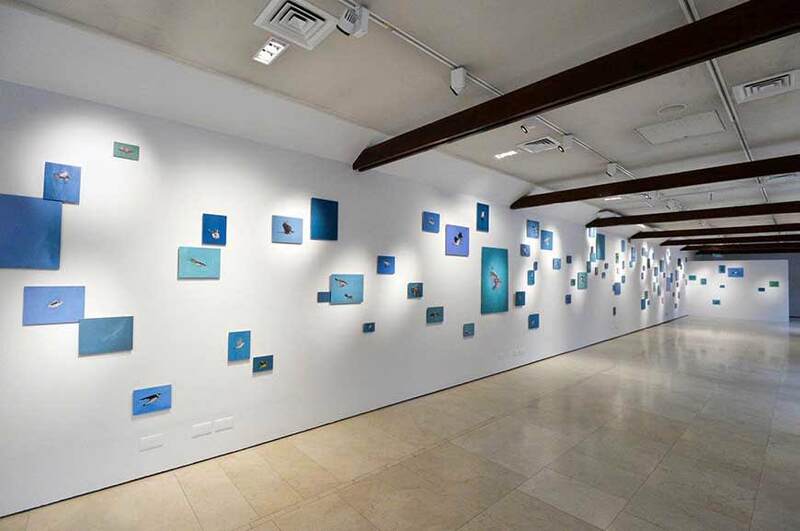 In his Farmleigh Gallery exhibition 'Crossing the Salt', Dunne reflects on changes wrought by the journeyings of water and the migration of wildlife and what they have to tell us about our identity. Cristin Leach the Sunday times art critic said of it "'Crossing the Salt' is, in equal parts, disturbing and delightful, ambitious in scale but delicate and measured in its presentation". 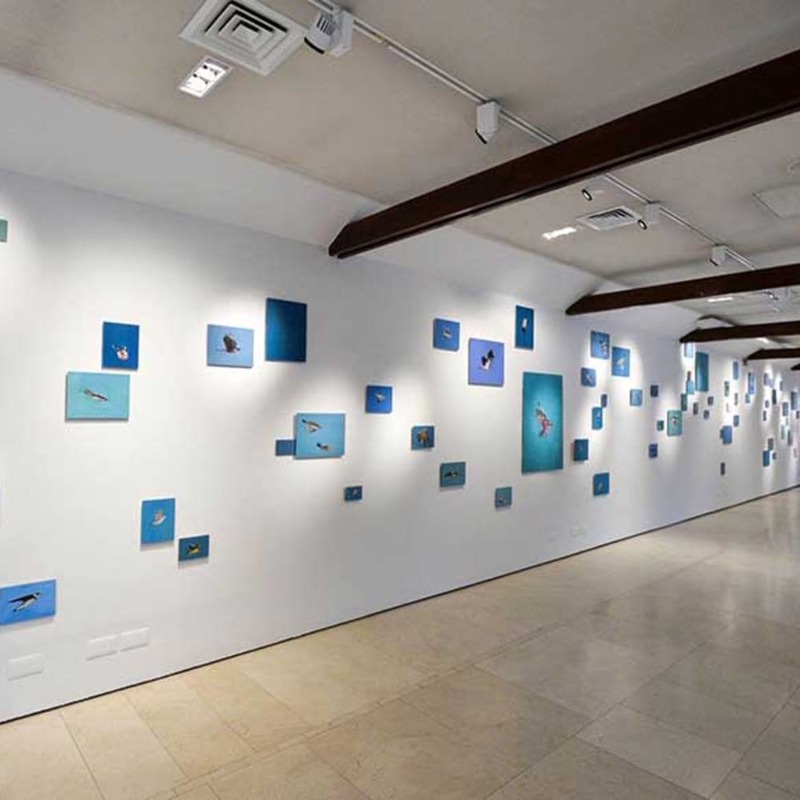 Over a hundred birds, painted on separate panels, plunge, swoop and fly in this large installation. In this and other works in the show Dunne uses colour and gesture to evoke the vulnerability and energy of his subject, and asks the viewer to think on issues of emigration, migration, absence, and our changing climate. Gabhann Dunne is a Dublin-based painter. He studied Fine Art Painting at the Dublin Institute of Technology and NCAD, Dublin. He is also a former winner of the RDS Taylor Art Award (2011) and the Hennessy Craig Scholarship and the Whytes Award for Painting for his entry to the RHA Annual Exhibition (2009). Dunne has exhibited widely, his recent shows include 'Crossing the Salt', Limerick City Gallery (2018), 'In the Presence of Birds' (2017), 'The Flower's Pilgrim' at the Molesworth Gallery in Dublin (2015), and 'Magenta Honey' at The Lab in Dublin (2015).